Imagine yourself standing amidst chaos, where acts of nature play out. As you stand on hot sandy plains with strong winds blowing particles into your eyes – so much so that you need to squint to make out the events happening before you-you almost couldn’t believe what you were witnessing. There, right before your eyes, a pack of lions was chasing their targeted prey. The pack moved in complete synchrony – almost as if this was a dance they’ve done over and over again. Their prey, a herd of wildebeest ran as fast as they could, looking for an escape. But alas, one falls victim, ready to be devoured by its predators. As the Lions take on their meal, all around them life still went on. Against a backdrop of the Savannah, you find gazelles and impalas grazing in sight, zebras quenching their thirst, and crocodiles waiting around while strategizing their next kill. If you’ve found yourself here, then congratulations! You’ve arrived at Serengeti National Park. What Makes The Serengeti So Special? The Serengeti is a vast plain that is made up of over 1.5 million hectares of savannah, true to its name, which is Masai for ‘endless plains’. The sheer size of the Serengeti makes it a unique and important ecosystem in and of its own in Africa. Serengeti National Park, which makes up part of the Serengeti ecosystem, is a UNESCO World Heritage Site as well as one of Africa’s Seven Natural Wonders. Each year the Serengeti becomes hosts to the largest mammal migration in the world, where over two million wildebeests and hundreds of other animals traverse the area in search of food and water. Curious travelers and nature enthusiasts alike flock to the Serengeti time and time again, often on a safari to witness this incredible wildlife movement that is often dramatic, gory and shocking. Where Exactly is The Serengeti? And When to Go? The Serengeti ecosystem is not located in just one country in Africa but is located between Tanzania and Kenya. In Tanzania, the Serengeti is made up of the Serengeti National Park while in Kenya, it is known as the Masai Mara. Smaller reserves in Tanzania that make up the ecosystem include the Maswa Game Reserve, the Grumeti and Ikorongo Game Reserves and the Loliondo Game Controlled Area. Though made up of different reserves and parks, there are no significant barriers or fences that will hamper migration, allowing for the ecosystem to stay intact and animals to move freely. 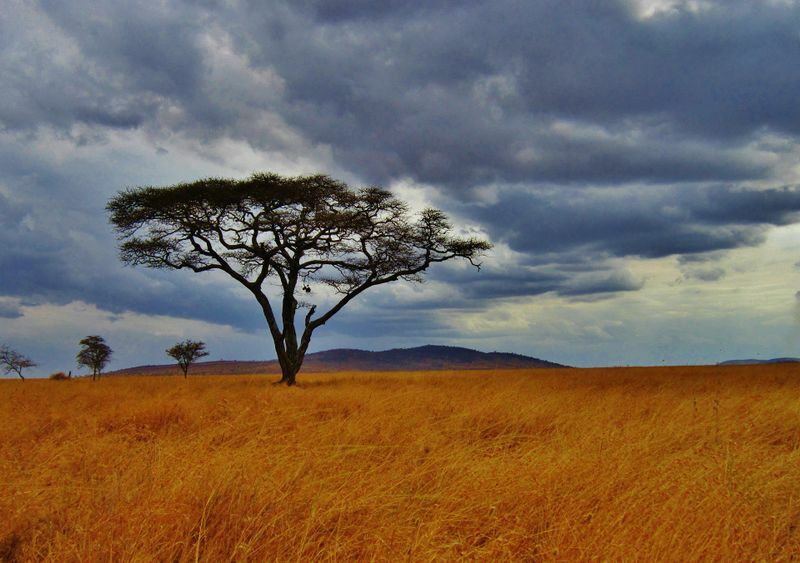 Weather conditions in the Serengeti are usually extreme with harsh winds and immense heat. The best time to visit the Serengeti is usually determined by the occurrence of rain, as rain influences the onset of migration. The wildebeest migration begins in December in the Ngorongoro National Park, south of Tanzania, where the animals begin their 1,200 miles journey. In February and March, the wildebeest bear their young and move north towards the Maasai Mara in May in search of grass and water supply. For most of the animals, the journey is perilous as predators lurk in search of easy prey. To reach the Maasai Mara, the animals have to cross the Grumeti River where crocodiles lie patiently before attacking. Once making the dramatic river crossing, the animals stay in the Mara from July to October and make their way back South when the rain returns, and the cycle begins again. There are plenty of ways to experience the Serengeti, be it on budget safaris in the Masai Mara or on luxury safaris witnessing calves being born earlier in the year at Serengeti National Park. Due to the popularity of the Great Migration, various tour groups and companies have set up a great number of different packages that can be tailored to your preferences. However, the best way to experience the Serengeti is arguably on a wildlife photography safari in the Masai Mara. There is something truly special about being able to photograph wildlife in its natural habitat, especially on a scene as exciting as the great migration. Capturing scenes through the lens of your camera is a great way to truly reconnect with nature and to really appreciate wildlife. There is no need for you to be a professional photographer in order to make the best out of your photography safari. All you really need is a keen eye and a willingness to learn. Your guide will help you decide the best time for photos and great locations for golden photo opportunities. 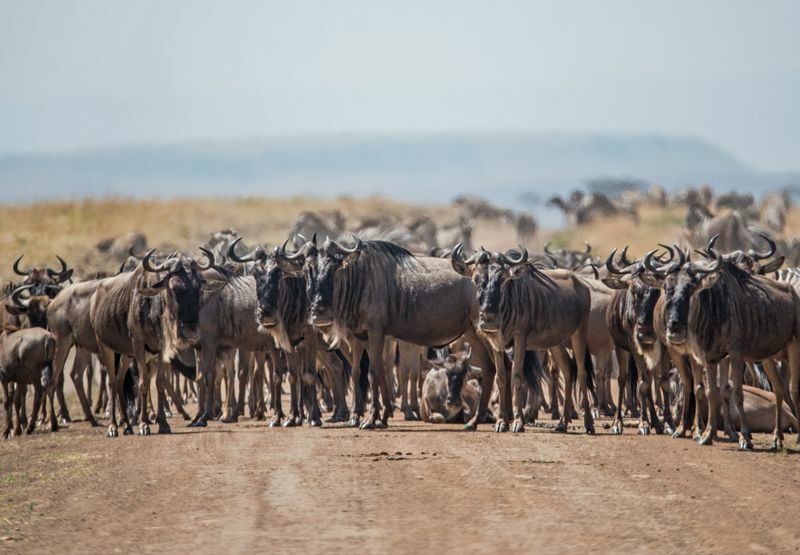 The most well-known species that partake in the great migration is none other than the wildebeest as 1.5 million of them move from Tanzania to Kenya each year. 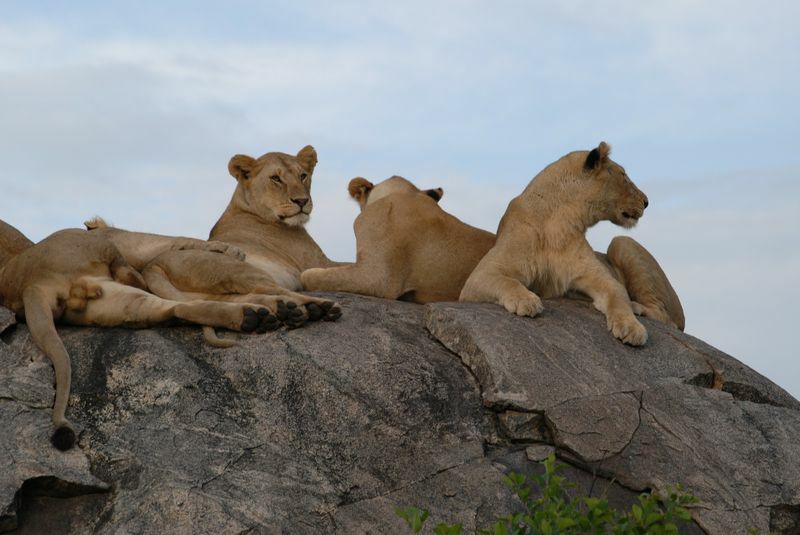 But they are not the only wildlife involved that you will have the opportunity to spot in the Serengeti. Below is a list of the amazing animals that you will likely to see during the great migration! Over 200,000 zebras accompany the wildebeests on their annual migration and usually arrive first at the Mara and where they can be found chomping down grass. 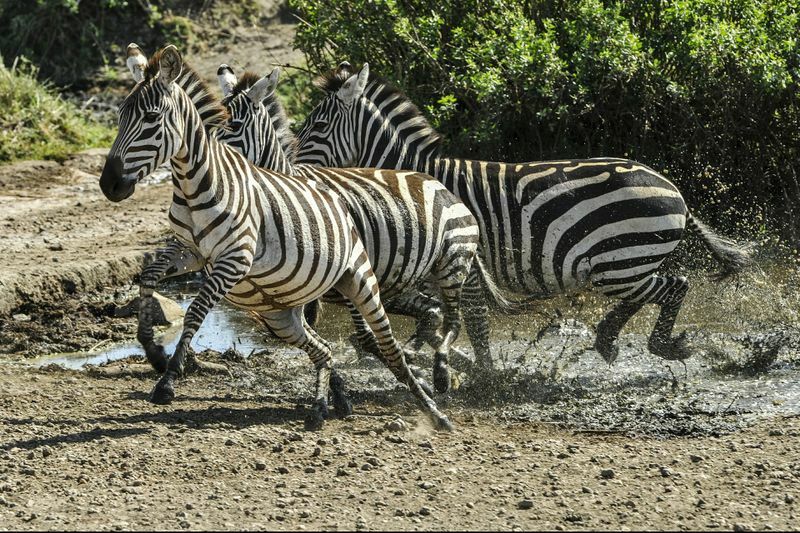 The zebras, with their superb eyesight and hearing, great agility and unique stripes, work together to fend off incoming predators during the migration, though some still fall victim to the attacks of mighty predators like the lion and cheetah. The Serengeti migration isn’t the only migration that zebras participate in. In fact, zebras have been recently discovered to journey over 1,000km through the Nxai Pan National park in Botswana each year – a more arduous than the great migration due to the remoteness of the area. Where there are preys, there will surely be predators. For predators in the African plains, the promise of over 2 million wildebeests with over 500,000 calves and a myriad of other smaller mammals including impalas, elands and Thomson’s gazelles attracts many predators including the African lions, cheetahs, hyenas, and wild dogs. There is an estimated 4,000 African lions, over 3,000 hyenas and up to 250 cheetahs that roam the Serengeti. The African wild dogs, once thought to be extinct in the area, have once again been spotted, numbering up to 300. Crossing the Grumeti River also puts the migratory animals at risk of being attacked by the Nile crocodiles inhabiting the area. Adult Nile crocodiles can weigh up to 1,000 pounds and reach 18 feet long, which makes the killing and consuming large mammals such as wildebeest, zebra and Cape Buffalo possible. These tall and magnificent mammals roam the African plains with over 4,000 of them within the Serengeti ecosystem. Height matters for the giraffe and a giraffe’s leg alone is 6 feet tall - taller than most humans! Their height enables them to reach leaves on treetops including from the acacia trees, which thrives in the Serengeti. To support their large stature, a giraffe’s heart weights at least 25 pounds. This is necessary to enable the heart to be strong enough to pump blood all the way to the giraffe’s brain. The quiet waterbucks are frequent inhabitants of the plains close to the Grumeti River in the Mara as they prefer to live near a stable source of water. 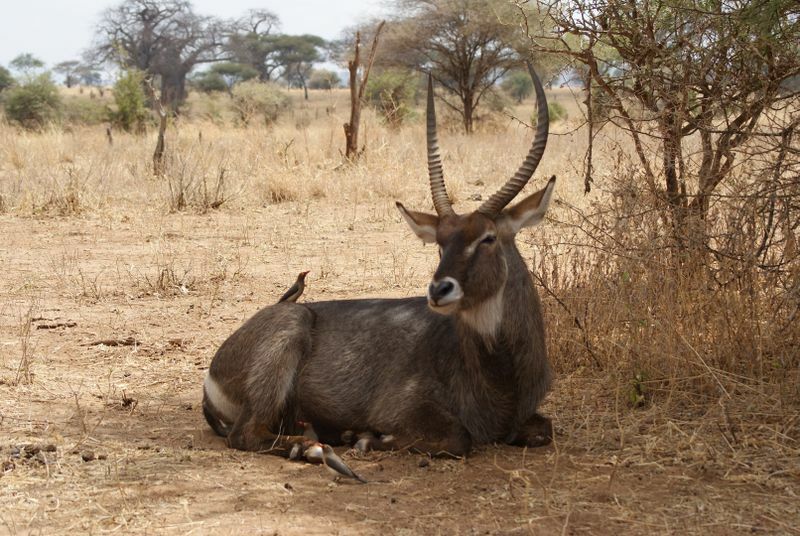 Unlike wildebeests and zebras, waterbucks are not migratory animals so chances of spotting them even during the off-season are highly likely. This sedentary animal is large and robust, with the male being at least 25% larger than its female counterpart. 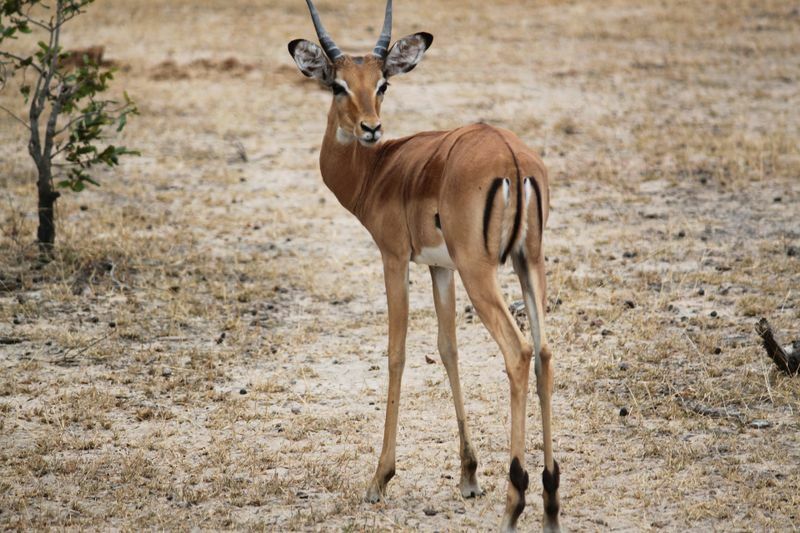 While the waterbuck is a known prey to lions and hyenas, older waterbucks aren’t desirable choices as their meat has an unpleasant odor caused by the waterproofing secretions of their sweat glands. 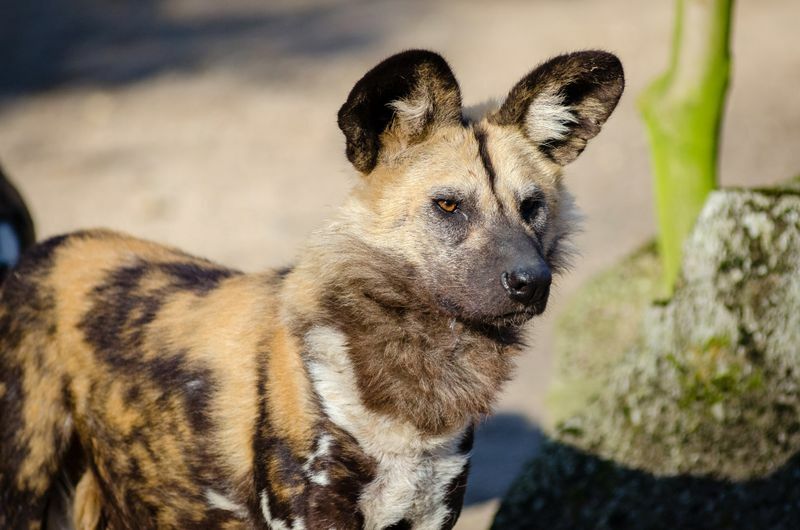 The African Wild Dog, also known as painted dogs, is an endangered species in Africa. In the 90s, populations of wild dogs in the Serengeti disappeared, causing experts to believe that the species was extinct. Fortunately, they reappeared in 2000 and were found east of Serengeti National Park in Loliondo. To conserve the wild dogs' population, the Serengeti Painted Wolves Project worked on conserving these packs and moved them in phases back into Serengeti National Park. While merely going on a safari in Africa is life-changing, nothing beats the adrenaline rush of watching the great migration in the Serengeti. At the Serengeti, you will be surrounded by an immense concentration of wildlife, all fighting to stay alive, be it going in search of food and water or defending itself from the deathly jaws of predators. If an ultimate safari experience is what you’re looking for, choose a safari in Serengeti! Inspired by the wildlife drama in the Serengeti? 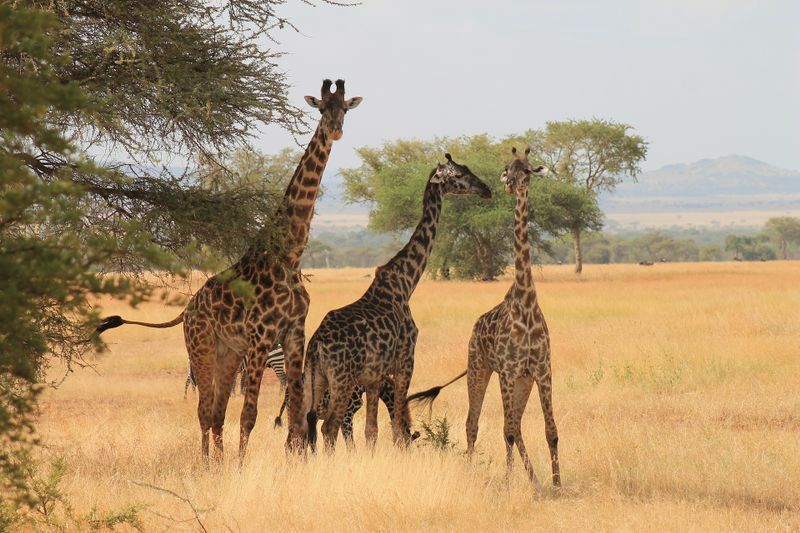 Experience it for yourself on a Kenya-Tanzania multi-country safari!